To summarize: we’ve become obsessed with Bob Ross’s wet-on-wet technique, his iconic personality (and hair), and his phenomenal marketing style. But in our research, we also found how Bob Ross went from a relatively unknown painter to a mega success. 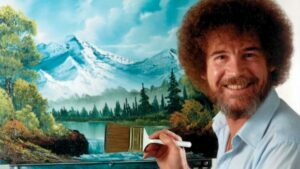 We learned that Bob Ross intentionally used smart marketing decisions to project himself as an authority on painting and proved his credibility to millions of viewers on a weekly basis. His marketing methods are as inspiring as his personal message. After a 20 year service record with the Air Force, Bob Ross decided to try his hand at selling his perfected art technique out of a mobile home. According to a Mental Floss article from 2015, “success didn’t come easy – or at all – during his time on the road.” Unfortunately, there just weren’t many buyers. Because Ross was virtually unknown, he had no authority for people to trust him or his product. He knew a change was needed to provide the results he had hoped for – so he turned to TV. After his failed mobile classroom Bob didn’t have much money to spend on his TV endeavor, so he scrimped and saved where he could. One of those areas was his hair, which he permed to save money on haircuts. However, his image was used for branding on a new collection of paintbrushes. Whether or not Bob Ross wanted, he was stuck with the now iconic haircut. Bob Ross saw phenomenal success with his program. “The Joy of Painting” ran for 11 years with over 400 episodes under its belt. During his time on-air, Ross encouraged creativity, the ease of which one could paint, and how you could impress yourself by following along with his show and believing in yourself. Those who did often sent in videos of themselves painting along at home. Ross proudly shared these videos with his audience – testimonials to the success of his teachings. And, of course, Bob Ross’s painting technique was anything but simple – but he made you think it was. Over the course of 11 years Bob Ross secured millions of fans worldwide. Because of his kind-hearted nature, people could tune-in without any sales pitches. These were replaced with footage of Bob and Jane, his wife, nursing wounded wildlife back to health. During his time on-air, Bob Ross began rolling-out a series of How-To books, paintbrush sets, videos, and Certified Bob Ross Instructors (with Jane being the first). An already established and treasured source to many, all Bob had to do to sell his product was to keep doing what he loved – painting on air. Bob Ross’s success grew well beyond his hairline – to the tune of a 15 million dollar empire. Built on art supplies and learning materials he never mentioned on air. He would eventually retire in 1994 due to health concerns, and pass away on July 4, 1995 at the too-young age of 52. Bob Ross and his team knew what they were doing. Just as he helped many improve their painting skills at home, we’d like to share with you his marketing style so you can grow your happy little followers from footy little hills into big beautiful mountains. Bob Ross knew he had a skill. He knew he wanted to reach as many people as possible with it – for altruistic reasons. In pre-internet days, this meant producing your own TV show. But Ross didn’t simply paint on air, he encouraged his viewers to do the same – or anything that brought them with happiness. Bob Ross, in addition to his painting technique, sold happiness. He would often say “if you want to see the bad stuff, watch the news.” This brought viewers back week after week to witness his iconic demeanor and uplifting message. Viewers were drawn to Bob for many reasons, knowing he had the magic to make them excellent painters and happier people. 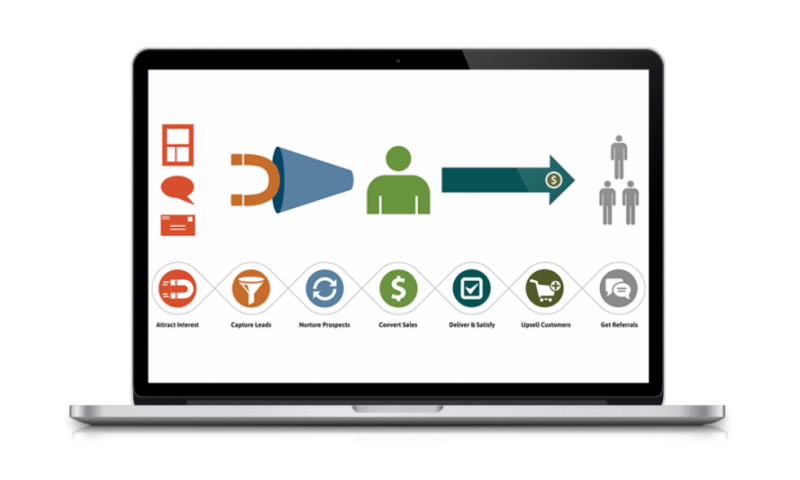 When structuring your marketing campaign, consider what you have to offer your audience. What can you teach them? What can they learn from you? How can you make it simple for them to include themselves in your knowledge? For Ross, this meant video of viewer masterpieces. For you, it can mean anything. A kind word, a great comment. A photo or video of your product in use. Real faces tied to your product provides substance to your marketing claim. With TV as his medium, it was difficult to tell where Ross’s audience was in their buyer’s journey. He had to develop a message that resonated with cold, warm, and hot audience members – all at once. His passive marketing engagement gave people the freedom to purchase when they wanted. There were no pressures to purchase anything. But for painting viewers, this was an exciting offer to feel included in the peaceful world of Bob Ross. If he were just painting, there’s little chance Bob Ross would have lasted on television for 11 years. It was his charm that kept viewers coming back, his smile at the end of each episode, and his vulnerability to share personal anecdotes. This is to say, he knew what worked. He knew what people wanted to see – and he kept doing it. It was a fail-proof plan once he found initial success, and since Ross was only limited to his imagination – his show could have continued for another 20 years with a dedicated viewership and unlimited examples of his passion. While there’s no one-right-way to market your business or self, Bob Ross embodies the steps business owners should take when approaching a marketing strategy. Provide value to your audience, keep it simple, encourage them, let them buy when they’re ready, and keep giving them information – and great products – to keep coming back for more.